Whenever people discover that I like to cook, the first question they ask is, “Do you have a big kitchen?” I pause. “Well. Um. Not really. No. No, I don’t. I have a narrow double galley with limited counter space.” But as soon as those words are out of my mouth, I immediately launch into an extended explanation of the kitchen’s many benefits. There’s amazing sunlight streaming in through the window. When the weather is nice, I can open the door to the fire escape and let the breeze waft in. The previous owner put in beautiful cabinets with lots of storage, including sliding shelves and a large pantry. There’s granite and stainless steel appliances and it was all very nicely done, but it’s just not what I would have done. So, I’ve been on a mission since we moved in a year ago to make the kitchen my own. And a week and a half ago, Matt and I, with the help of our amazing handy man, installed a backsplash. We spread thin set. We cut tiles. We placed the tiles and the following day, I applied the grout and sponged off the excess and second guessed my work half a dozen times. But in the end, despite it’s many minor imperfections (or maybe because of them), our cozy little kitchen really feels like ours. This weekend while we feted grandma in Maine, mom and I recalled the last time we “installed” a backsplash together. The kitchen in Maine was always a cabin kitchen – laminate counters, open natural wood shelves hanging from the ceiling on metal cables. The cabinets were painted mauve and later tan and the floors are pine. The window overlooks the garden and there’s a thermometer just outside that we check on cold winter mornings to see how far below zero the temperature has fallen. There’s an old ivory-colored corded phone hanging on the wall and a basket with trail and river guides. We will never put in granite. We will never put in stainless steel. 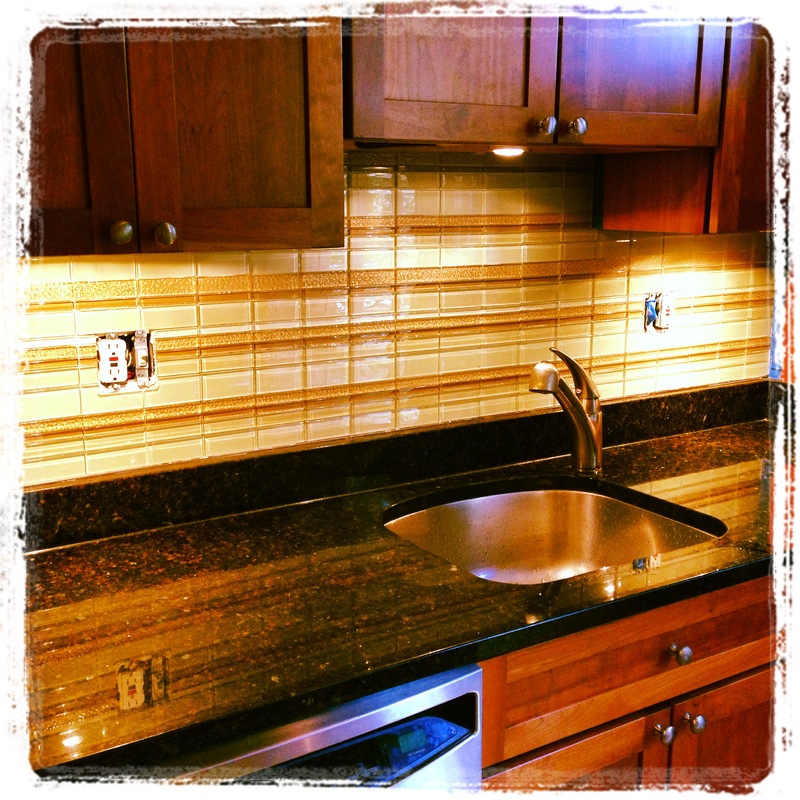 There will never be a tile backsplash, but year’s ago, mom wanted a change, something fun and bright. So, with a pint of paint a piece, the two of us painstakingly painted a checkerboard of faux tiles behind the kitchen sink. When Matt and I returned home on Sunday from our family weekend to our cozy little kitchen, I was inspired to cook some cozy food, rife with carbs and cheese and butter. I think I may have found my new favorite comfort meal. Caramelized onions, wild rice, swiss cheese, and bread crumbs, with a little bit of kale to make us all feel better about ourselves. It was warm and it was cozy and it reminded me of a cold winter night in Rangeley, sitting at the kitchen counter with our bowls of hot supper, next to the wood burning stove, admiring our hand drawn tiles across the way. Cook the rice according to package directions. Preheat your oven to 375 degrees. Meanwhile, caramelize the onions. Heat the butter and olive oil in a large, heavy skillet over medium-low heat. Add onions, sprinkle with salt and a little pepper, and cook until they’re tender and sweet, stirring occasionally, about 30 minutes. Add the kale ribbons, and cook until they wilt a bit, about 5 minutes. 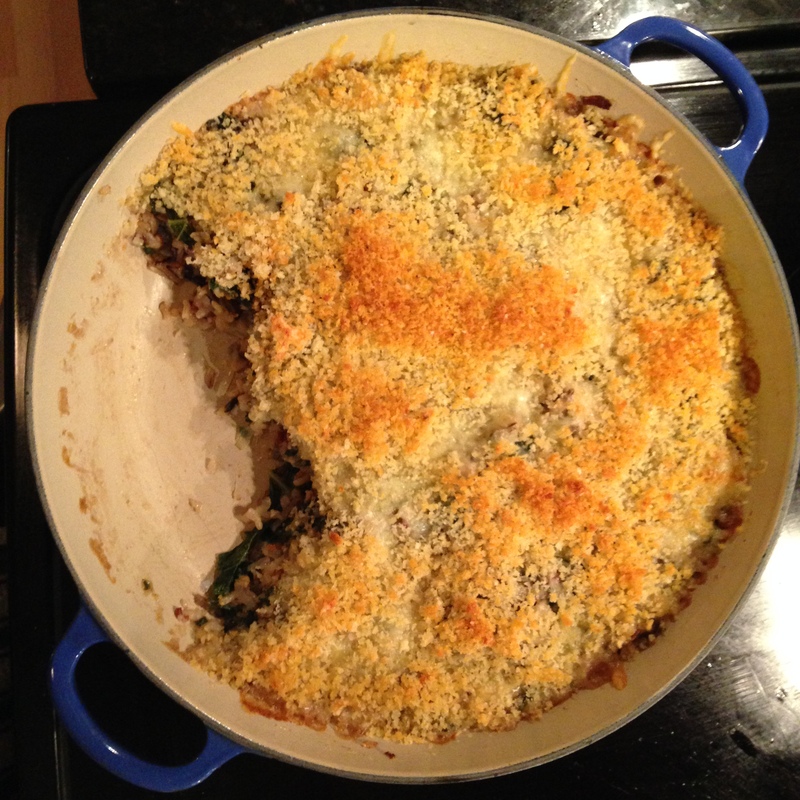 Stir together the onion-kale mixture, wild rice, and 1 cup grated cheese in a large bowl. Season to taste with additional salt and pepper, if needed. Assemble the gratin. Use 1 tablespoon butter to generously coat a 2-quart baking dish. Spread the wild-rice mixture into prepared gratin and pour broth over it. Sprinkle remaining cheese over gratin. Toss breadcrumbs with 1 tablespoon melted butter and salt and pepper to taste; sprinkle over cheese. Bake for 30 to 35 minutes, or until a little bubbly and beginning to brown on top. Tags: cheese, comfort food, fall, gratin, rice | Permalink.